Photos, videos, and pricing options will be available here when available –– closer to the sales release date. Log species — ALL pines, spruces, firs, hemlocks, and larches. Not yet tested on cedar. Moisture content — works on green and dry logs; expected to work on frozen logs (not yet tested). Carriage runs on rails on high-load, totally-sealed roller bearings. 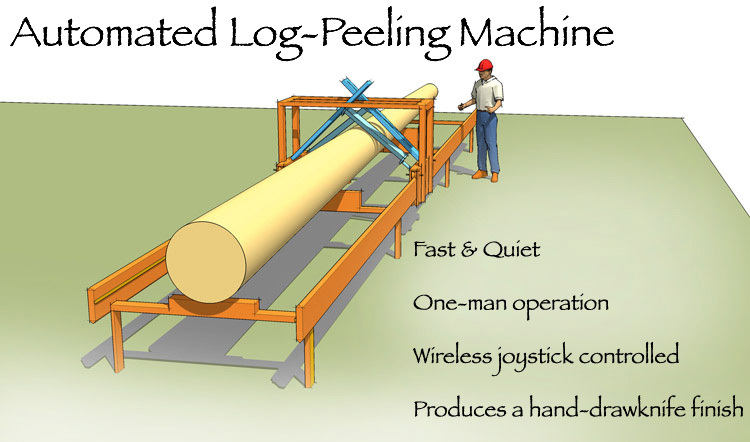 Wireless, portable, joystick control of all peeling and debarking operations. The TM-60 waist-mounted model is pictured. • Method of loading and unloading logs onto the machine: can be crane, loader, forklift, Hiab, or etc. • Your logs: mud, silt, dirt is okay, but rocks will dull or chip the knives. • Per hour, a skilled man with a drawknife can debark and peel about 10 lineal feet to 13 lineal feet of average-size logs. • The cost for hand-drawknifing ranges from $1.25 to nearly $2.00 per lineal foot; which comes to $12.50 to $26.00 per man-hour. • The Chambers Peeler can peel about 60 lineal feet of log per hour, and uses only 1 man to operate. • The Chambers Peeler produces more peeled log in 1 day than a skilled man with a drawknife produces in 1 week. • The Chambers Peeler can peel more than120,000 lineal feet of peeled log per year (at 40-hours per week). • An average log shell that uses 3000 lineal feet of logs (2600 square feet shell), the Chambers Peeler would peel the logs for that shell in 50 hours (6 work-days). By hand, peeling those same logs would take 260 man-hours (more than 32 work-days)! This machine does not have a rotating planer head (Spar-Log peeler type). This machine is not a spiral or ring-type de-barker. This machine is not a Rosser-head de-barker. Fully motorized and powered operation. 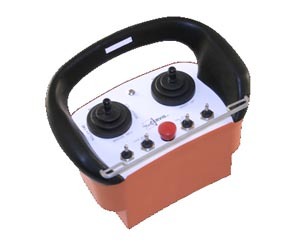 Remote control of all vital operations—operator can walk around with the portable controls on his waist. Hands-off operation—the operator does not touch the machine, log, or knives, during peeling operations.